Before a father leaves for his longest business trip yet, he encourages his son and daughter to remember, 'Even when I'm not here, God is always with you'. After he leaves, the boy and his little sister spend a fun-filled day and star-filled night remembering everything their father told them about their heavenly Father: He is powerful, loving, everywhere, all-knowing, perfect, merciful, unchanging, creator, and a Father who wants to be known, talked to, obeyed, and worshiped. 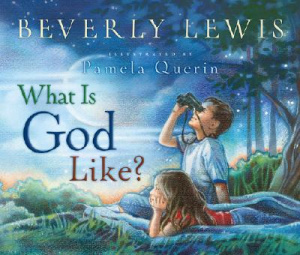 With imaginative text, Bible verses, and inspiring full-colour illustrations, Beverly Lewis and Pam Querin take difficult concepts and bring them to life in the minds of children - and parents, too! What is God Like? by Beverly Lewis was published by Baker in November 2008 and is our 19676th best seller. The ISBN for What is God Like? is 9780764204661. Reviews of What is God Like? Be the first to review What is God Like?! Got a question? No problem! Just click here to ask us about What is God Like?. A:This book is suitable for 6-8 year olds. Thank you for using the Q&A Forum. Details for What is God Like?